Kali’s teenage life gets swept up in a whirlwind of cosmic adventure. With a quirky ageless comrade, an unsuspecting mother and an enlightened master to help fulfill her destiny, kali embraces her supernatural powers. From mysterious revelations in Los angeles to bizarre events in ancient Varanasi, her trials transcend time. What is this plot that can plunge the world into darkness? 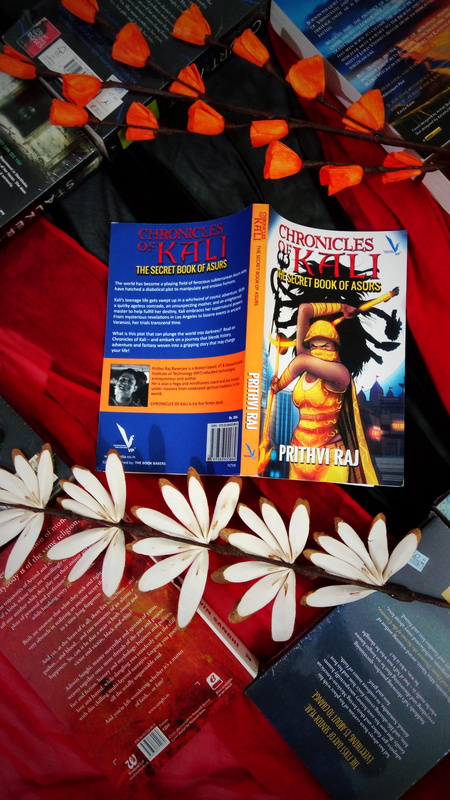 Read on Chronicles of Kali – and embark on a journey that blends history, adventure and fantasy woven into a gripping story that may change your life. I could see lot of fantasy books by Indian authors nowadays which makes me happy. In the book Kali maa’s story has been told on the floor of modern world which makes the story thrilling and interesting. You find a different perspective of who is Kali and For what she was destined to. Patricia who is a bestselling author was caught in her writers block. She is empty by mind and in search for good tip to write a book. Percy her butler tells her the story of Bakasur , Asur King who wrote a secret book. Soon she was tempted to know more about the story. Percy asks her to visit India to meet his master in order to touch the root of the story. Pat decides to travel to India. Does Percy have any connection to India? Who is the master? What the secret book holds? Does Pat gets herself into the trouble? Author brilliantly induced the philosophical life lessons with this fictional fantasy book. If you wish to clear your mind from unnecessary thoughts without going to any boring lectures then this book is for you guys. The book has some interesting characters . Kali is quite an amusing girl who loves her world and life. She is used to her difficult times but still admires the beauty in it. Be it her pure way of handling tough things was narrated well. Master Vyas and Percy had their own contribution to the book. I loved Chinta over Bakasur not for the good things he had but for his innocent gesture when he was back to his real form. The minute twists and thrill was nice but I felt it was left hanging on a midway. When the school authorities informed Pat about the break regarding Kali files and when Pat found that someone was inside Kali’s room.The thrill went to back seat. The thriller portions were covered with funny moments and conversation which was nice in one way but I expected the nail biting scenes at that portions. Box of Thoughts and Man from silver screen chapters are my best one. The illustration helped me to understand effectively. The middle the story was blunt but once Chinta character was introduced the story was back to its track. The narration was simple and no complex methods were used to explain the philosophical thoughts. Now I know,with whom and for what Kali Maa fought. The maze portion was too good. The mind controls and takes over us easily. A single chatter destroys the whole universe,Even Kali had to fight herself to get out of it. The Secret Book of Asur were really good and thought provoking( in a good way). Overall ” Chronicles Of Kali,The secret book of Asur” is a fanstasy adventure of Kali who fights with the real enemy , the mental chatter.. As now the book is in our hands , hope we control our mind and thoughts for the good of future world. Prithvi Raj Banerjee is a Boston-based, Indian Institute of Technology & Massachusetts Institute of Technology (MIT) educated technologist, entrepreneur and author. He is a Yoga and mindfulness coach and has trained under masters from celebrated spiritual traditions in the world. Prithvi has co-founded two technology start-ups. An avid traveller, he shuttles around the globe with his college sweetheart & wife of 23 years, and their two lovely kids. He the founder of the MindGym initiative, which is focused on creating awareness about Mindful thinking amongst the younger generation. It uses a contemporary narrative to demystify mindfulness practices using mobile games and brainwave based biofeedback. He is also the author of the book, Unbox! – The power of Mindful Thinking. Unbox! is a practical guide that focuses on how we can deal with mental chatter that fragments our attention. It uses ‘mind-exercises’ to help us enhance our attention as we build the skill of Mindful Thinking that leads to more efficient and impactful actions.